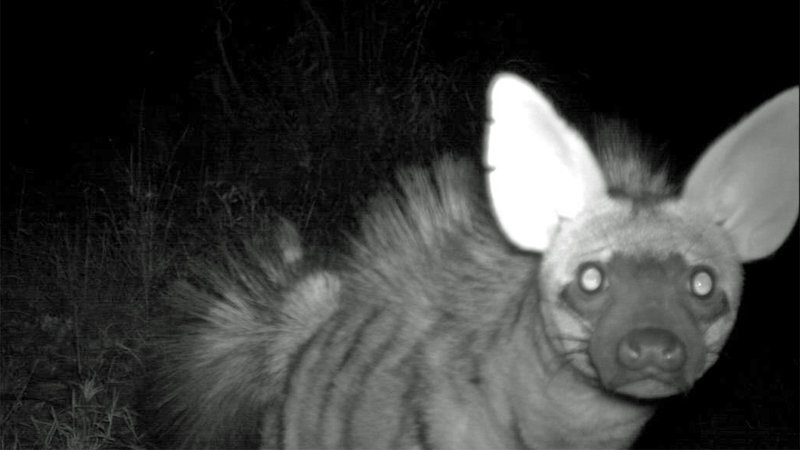 What are the aardwolf’s closest relatives? Aardwolves are the only species in their genus and the only genus in their sub-family, but they are in the family Hyenidae, along with spotted and striped hyenas. Aardwolves lead mainly solitary lives, though they are socially monogamous, which means they stay with the same mate their whole lives. They fiercely defend their territories, as these are what determine access to food and mates. Aardwolves communicate mainly through scent-marking, both to defend their territories and to time matings. They also use a range of verbal cues, particularly when they’re upset, including purrs, whines, clicks, growls, snarls, barks, squeals, and clucks. Nocturnal animals, aardwolves rest in their dens or in the shade during the heat of the day. 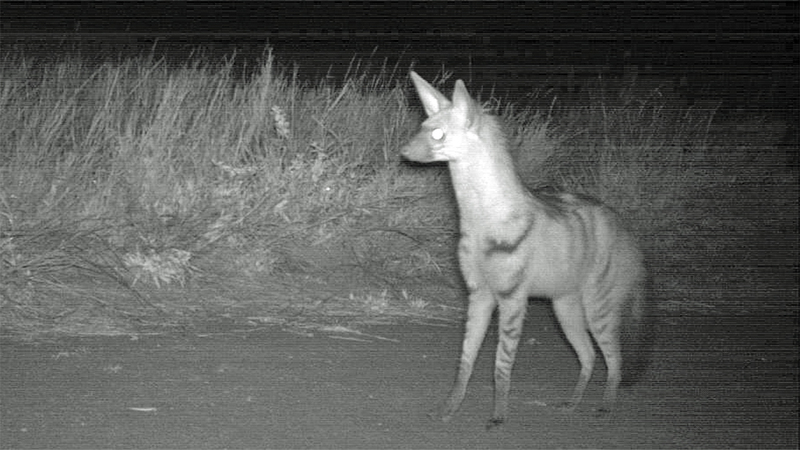 In the cooler winter months, aardwolves may venture out during the late afternoon hours as well as at night. During the winter, their body temperature drops 18 percent, which allows them to conserve energy and decreases their need for water. Aardwolves adapt and expand dens dug—but abandoned—by springhares, as their front legs aren’t strong enough to dig new dens. The International Union for Conservation of Nature (IUCN) lists the aardwolf as a species of lower risk. But like many African carnivores, they do face threats from habitat loss. Two distinct subspecies of aardwolves, separated by more than 930 miles (1,500 kilometers), live in Africa. The southern subspecies ranges from Angola to Zimbabwe and south to the Cape of Good Hope. The northern subspecies lives along the coast of northeast Africa, all throughout the Horn, and as far south as Tanzania. 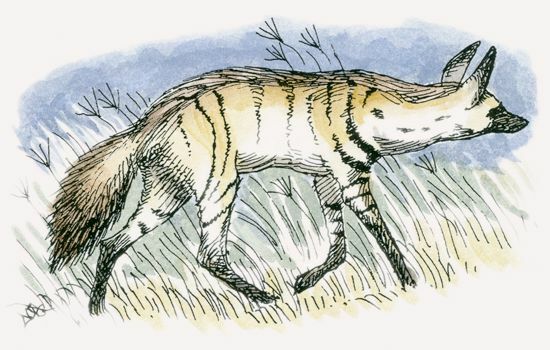 Aardwolves prefer open grassy plains, though they’ll live almost anywhere that gets between 4 and 31 inches (100 and 800 millimeters) of rain each year and has enough termites for them to eat. 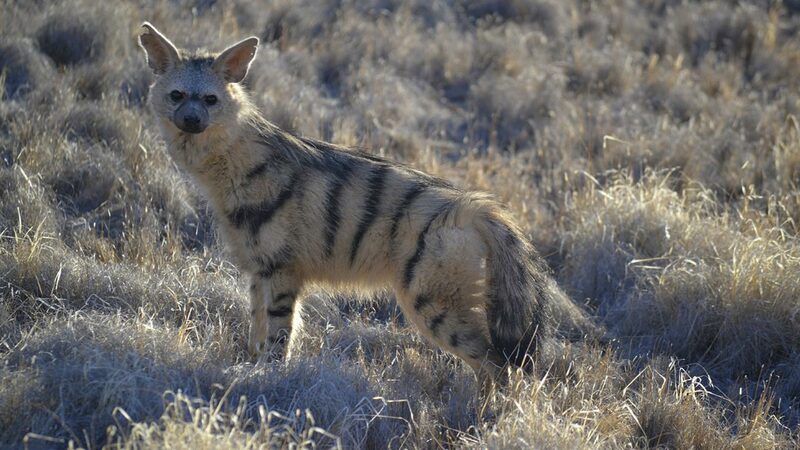 Aardwolves tend to avoid dense forests or dry desert. Though they resemble miniature hyenas, aardwolves eat and behave quite differently. Rather than having strong, bone-crushing jaws, they have delicate skulls and teeth that are more suited to their termite diet. Their well-developed senses of sight, sound, and smell help them track food. But rather than digging for their meals, aardwolves lick the insects off the ground. They are so well adapted to eating termites—and so successful at exploiting this food base—that they have almost no competition from other animals. Like hyenas, aardwolves have well-developed canine teeth that would allow them to kill bigger animals, but they lack molars that would let them chew and digest bigger prey. 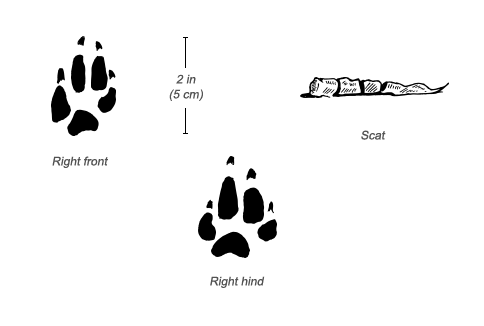 Though social mates share a territory, either the male or female also may mate with another aardwolf. However, they will only raise offspring with their paired social mate. The male social mate helps raise the cubs, even if he is not the actual father. Litters of two to four cubs are born in the mother’s den, where they stay for a month. They begin to play outside the den when they are between four to six weeks old, but only when adults are present. Next, they begin to play unsupervised—but still very close to the den. When they’re 9 to 12 weeks old, they begin to forage with an adult. For the next few months, they’ll venture farther, but still stick close to one of their parents. Young aardwolves bunk with siblings or a parent during the winter, cuddling to help keep warm. 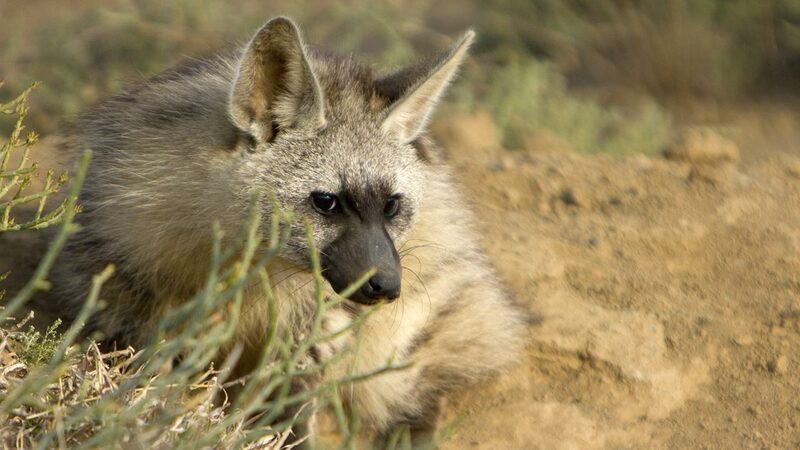 Aardwolves may share foraging areas and even termite mounds with aardvarks and a bird called the southern anteater-chat, but would chase a jackal away from their dens. Although aardwolves live throughout Africa, they’re not very common. In a suitable habitat, such as Serengeti National Park, they may be found in densities of 2.6 adults per square mile (1 per km2). However, their nocturnal, elusive nature also makes them difficult to count. It’s likely there are more of them than scientists have recorded. ​Aardwolves have tough, sticky tongues that protect these animals from termite defense secretions.